Back in February 2007, inclement weather gave me a day off from work, and I spent it at the movies. I greeted two disparate viewing choices: the widely-panned broad comedy Norbit and the hugely-praised dark fantasy Pan’s Labyrinth. Of course, I opted for the Eddie Murphy flick. I knew the extreme difference in critical views involved for both, I just wasn’t in the mood for anything serious that day, so the light comedy felt like the right decision. It wasn’t. Within a very short period of time, I recognized that I’d made a horrible mistake. Labyrinth hadn’t started yet, so I bailed on Norbit and watched it instead. While certainly more satisfying than the atrocious Norbit, I didn’t find myself entranced by Labyrinth, which I thought offered only occasional pleasures. Almost 10 years later, I figured I should give the movie another shot and see if I can grasp its appeal better in 2016 than I did in 2007. Set in Spain circa the spring of 1944, the remnants of the recent civil war still haunt the country. Along with her pregnant/ill mother Carmen (Ariadna Gil), young Ofelia (Ivana Baquero) goes to live with her stepfather Captain Videl (Sergi Lopez). Part of the force run by fascist leader Generalissimo Francisco Franco, the vicious Vidal hunts down remaining members of the rebel Republican army. Stuck in a violent world, Ofelia interacts with a more fantastic realm when she meets a fairy who introduces her to an amazing journey. Like I mentioned at the start, Labyrinth left me underwhelmed when I saw it theatrically, so much so that I didn’t bother to review the DVD at the time. All these years later, I figured my mood may have impacted my impression of the film to such a degree that I couldn’t appreciate the movie’s pleasures. Almost a decade down the road, does this Blu-ray screening of Labyrinth convince me that I was wrong in 2007? Not really – I appreciate aspects of the movie but don’t think it comes together in a wholly successful way. Many adore the film’s fusion of reality and fantasy, but I feel this combination doesn’t work well, largely because Ofelia’s visions just don’t seem very interesting. Del Toro creates a world with imaginative visuals but even among the fantastic creatures, Ofelia’s personal journey fails to turn into anything memorable. Instead, we’re left with a path that we’ve seen in umpteen other movies. How many times do we get a young protagonist who needs to complete a series of tasks to return home/achieve a major goal? Approximately 17 skillion, and Labyrinth doesn’t add life to this well-worn concept. Rather than offer a dynamic aspect of the narrative, Ofelia’s fantasies instead become an unwelcome attraction from the more interesting story: Captain Vidal and the rebels. That aspect of the movie takes up a lot more of the running time than previews/synopses imply, and this side becomes by far the most dynamic. Granted, I won’t claim the story of Vidal and the rebels offers anything particularly original either, but del Toro manages to execute those situations and characters in a more involving manner. Ofelia and her pals don’t turn into much that sticks with me, but Vidal and the others create a dramatic tale. Unfortunately, Labyrinth focuses too much on Ofelia for the remaining elements to ignite. I get what del Toro wants to do with the girl’s path – I just don’t think he achieves his goals. These factors leave Labyrinth as a visually impressive piece that only occasionally delivers an engrossing drama. 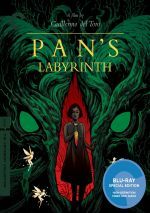 Pan’s Labyrinth appears in an aspect ratio of approximately 1.85:1 on this Blu-ray Disc. As expected, the movie delivered a pleasing presentation. Overall definition appeared very good. A smidgen of softness crept into some wider images, but not in a distracting manner. Jagged edges and moiré effects remained absent, and I saw no edge haloes or print flaws. The film highlighted teal to a heavy degree, with occasional uses of amber/red. Within the film’s stylistic choices, the colors appeared well-rendered. Blacks worked well, as they gave us deep, firm material, and low-light shots displayed nice smoothness and clarity. This became a fine image. I also felt pleased with the involving DTS-HD MA 7.1 soundtrack of Labyrinth. Much of the movie emphasized general atmosphere, and those elements formed a convincing sense of the various settings. When the movie entered fantasy circumstances, though, the material kicked into higher gear. Flying elements such as fairies zoomed around the room and the creative concepts managed to form a lively impression of the amazing experiences. These filled the room in a compelling manner, as did a smattering of combat sequences. Audio quality satisfied as well. Music seemed lush and full, while speech cane across as natural and distinctive. Effects offered fine clarity and accuracy, with deep low-end as necessary. The soundtrack added to the movie’s impact. When we shift to extras, we open with an audio commentary from writer/director Guillermo del Toro. He offers a running, screen-specific look at influences and historical/mythological areas, connections to The Devil's Backbone, story, characters, themes and meaning, visual, color and production design, costumes, creatures and effects, music and audio, and related domains. In other words, del Toro touches on pretty much everything one would want to learn about the movie. A veteran of the format, he handles the commentary with ease and reveals a thoughtful filmmaker who invests a ton of energy into his work. Del Torn gives us a terrific and insightful chat. Del Toro also gives us an introduction to the film. In this 25-second clip from 2007, he hints at the movie’s challenges. It’s not very useful. Under Del Toro and Funke, we locate a 2016 chat between del Toro and novelist Cornelia Funke. It lasts 39 minutes, 21 seconds and provides a discussion of fairy tales/fantasy and their use in del Toro’s movies. Del Toro carries this, so Funke just says “yes!” in response to his statements a lot of the time. 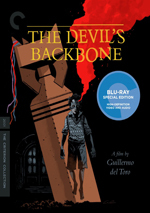 Some insights emerge, but del Toro already covered so much in his commentary that the program seems less than stellar. Billed as an “interactive gallery”, the Director’s Notebook lets us explore a variety of elements. After a 35-second intro from the filmmaker, this leads us through a literal look at the notebook del Toro created for various characters/concepts, but it also branches off to “video pods” at times. In the “Notebook”, we find six of these clips with a total running time of 15 minutes, 15 seconds, as they offer more notes from del Toro about design issues and influences. Once again, he provides solid information. Within Documentaries, we discover four pieces from 2007: “The Power of Myth” (14:24), “Pan and the Fairies” (30:27), “The Color and the Shape” (4:02) and “The Melody Echoes the Fairy Tale” (2:48). Across these, we hear from del Toro, DDT Special Effects’ Montse Ribe, Arturo Balsero and David Marti, Café FX’s Everett Burrell, and actors Doug Jones and Ivana Baquero. These examine the use/influence of fairy tales, story/character domains, symbolism/meaning, creature design and various effects, color choices, and music. Inevitably, some of the info repeats from del Toro’s commentary, but we still get a lot of good new material, and the use of behind the scenes footage embellishes the remarks. An interview with actor Doug Jones runs 25 minutes, 38 seconds and provides his thoughts about working with del Toro and various characters/performances in his career, with an emphasis on Labyrinth. Open and entertaining, Jones gives us a great view of his unusual acting challenges. From 2005, we get a glimpse of an Ivana Baquero Audition. During the two-minute, 55-second clip, we see Baquero test for her part. It offers a nice addition. We also locate four Prequel Comics. These semi-animated pieces give us backstories for the Giant Toad (42 seconds), the Fairies (0:32), the Faun (0:48) and the Pale Man (1:18) – sort of. They’re brief and end abruptly, which makes me feel like we only see the beginnings of the tales and not much else. Video Comparisons splits into three areas. “Lullaby” (2:17) mixes movie photos with a music demo, while “The Green Fairy” (1:18) offers a splitscreen look at raw footage vs. final effects shots. “Thumbnails/Storyboards” breaks into five smaller sections. “Del Toro Intro” (0:29) sets up what we’ll see, and the others let us examine thumbnail sketches, storyboards and final film for four scenes: “Ofelia Enters the Labyrinth” (4:08), “Ofelia and the Giant Toad” (1:58), “Death of the Doctor” (1:28) and “Ofelia’s Death” (3:04). “Lullaby” and “Fairy” are minor additions but “Thumbnails/Storyboards” gives us good material. The disc finishes with ads. We find two trailers and seven TV spots. A booklet completes the package. It presents credits and an essay from critic Michael Atkinson. It’s not among Criterion’s best booklets but it includes some useful material. With its mix of reality and fantasy, Pan’s Labyrinth promises a rich character fable. At times it succeeds but the movie fails to coalesce in a manner that allows it to achieve most of its goals. The Blu-ray provides very good picture and audio along with a winning roster of bonus materials. Maybe someday I’ll connect with Labyrinth, but not today.